Enjoy this private 8 hour tour from Lisbon, and discover one of the most intriguing orders of the history, the Knight Templars. You will enjoy this magnificent tour in your own private luxury vehicle, with a private driver and a private tour guide, who will tell you and show you all the history and secrets of this 12th Century order (including a UNESCO World Heritage Castle, builded in the 11th Century). You will also visit surrounding attractions and villages next to Tomar. Visit one of the portuguese villages that hosts more monuments: Tomar. Which has, apart from the 1160 Castle of the Knight Templars, 2 amazing churches and one 15th Century jewish synagogue. Get to know Constância Village, a 900 inhabited city on your way to Tomar, where you will try the traditional sweet ‘Queijinhos do céu’. Enjoy this private full day tour and get to know the fantastic and mysterious history of the Knight Templars that took care of the portuguese from the Moors during the Christian ¨Reconquista¨. Your private driver and tour guide will pick you up, in your private luxury vehicle, and take you to Tomar, where you will see and learn about the history of the Knight Templars of Portugal. Enjoy this private 8 hour tour and take the best from your time in Portugal. The Knight Templars settled in Portugal in the 12th Century, with the aim of helping the catholics with the Reconquista and to continue the Crusades. They founded a Castle, in 1160, which was inspired in the Holy Land, which at the time was the most advanced military stronghold in the Kingdom. Two Centuries later, the order was dissolved, in 1312, by Pope Clement V, in order to lower their fame and power. On your way to Tomar, between the river Tagus and its tributary to Zêzere, you will visit the Almourol Castle, to where you can arrive only by boat. This enigmatic castle is located in the middle of the river Tagus, is one of the most emblematic monuments of christian reconquest. The Castle has been kept by the Knight Templars until mid 13th Century, and then it was laid forgotten until the romantic spirit of the 19th Century restored it, being today a very well kept monument. On your way to Tomar, you will pass by a 900 inhabitants riverside village called Constância Village. This small village is surrounded by a beautiful landscape, it was the home for the famous writer Luís de Camões. Here, you will try a traditional portuguese sweet, the ‘Queijinhos do céu’. Once you arrive to Tomar, the place that hosted the Order of the Templars in the 11th Century, who received this lands in 1159 as a reward for the assistance they gave to Dom Afonso Henriques (the First King of Portugal) in the Christian reconquest of the territory. Gualdim Pais, the first Grand Master of the Order in Portugal, was the one who founded the castle and the amazing Convent of Christ inside. This castle nowadays is, since 1983, a World Heritage Site. Inside you will be able to see the Charola, the Knights round temple, the unique western window designed in Portuguese late gothic style and the main cloister, a masterpiece of Renaissance architecture. 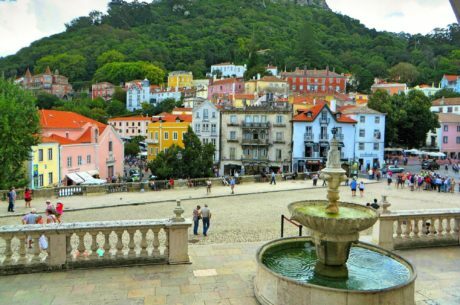 Once you have finished this private Full Day tour, where your private tour guide will have showed you and told you one of the most interesting historic places of Portugal, you will drive back to your hotel or place of choice in Lisbon. We have suggested a 8 hour tour, but it is possible to do a shorter or longer experience. All the tours we offer at Tour Travel and More are totally adjustable to the interest and likes of our clients. Please, do not hesitate in asking, our work is to make the best possible tour for each client.